WARNING: I did finish the game. I did enjoy playing, not the story. That said it is not a game I would recommend people to play. Should you spend hours on end in a dessert in order to find a hidden treasure? I would think not. Borderlands is really not made for every one out there. Those who did finish it, I salute you and would like to ask which class and weapons you used. Those who played one hour and thought that it was going to remain the same for the rest of the game, well I can tell you that it does just that except at the very last minute but by then it is far too late. 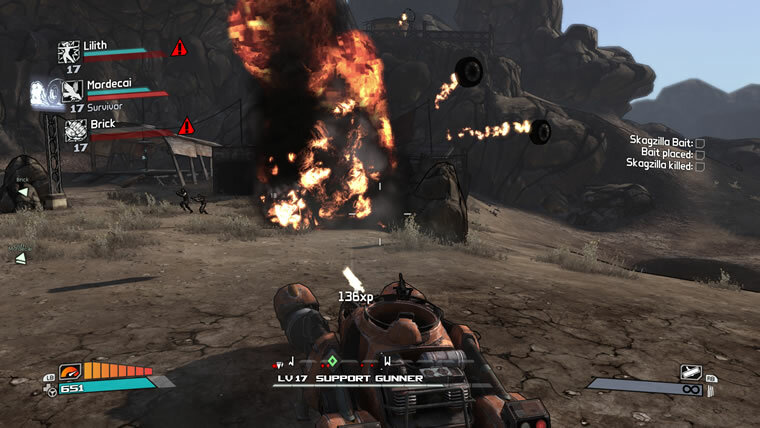 Borderlands takes place in the future in the planet of Pandora. You will not see giant blue people or dense jungles but a desert that seems to be the only place where people live. Most of it is overrun by bandits and the only reason that you are in this desolated place is to find the Vault. The Vault being a hidden treasure that every one is looking for, who would have guessed! The story takes you through three big areas, each with their own smaller areas. Which will make you wait at loading screen for long periods of time. You follow the guidance of an angel of some sort that says it’s there to help you. You will be speaking with very few key NPC’s and all they will do is give your next quest which will either be killing some one or talking to some one. There is very little voice acting and they will give you your quest through long monologues that you will have to read. This will get very boring very fast which will undermine the story because you will just be pressing X/A as fast as you can so you can follow the new objective often without knowing why. The story itself is nothing special. It is basically you going after what you think will help you open the Vault. It could have been a lot more interesting that it was but it was the same thing over and over with stronger enemies. Often when you found something important or did something that was a key part of the story, some one would start speaking to you. Most of the time the noise around you would make it hard to hear what was being said and so you lost interest because you only got half of the message. Had there been maybe a bit more dialogues, and not just one side monologues, revealing interesting information it would have been more fun to listen to what they had to say. The beginning of the story promised a tale which didn’t take itself too seriously and which had its own kind of dark comedy. Although it is present at the very beginning it quickly fades away and all you get are little bits here and there. Mostly during important boss fights which make you go “HAHAHA THAT IS FUNNY, three balls….”. But for the most part you will not be laughing very often. Bosses are very simple and there is not one that cannot be overcome with sheer gun power. The side quests often provide answers as to why things are the way they are and sometimes reveal some details about certain characters. But more often than not, they are a way out of your path that will reward you with a piece of equipment that will no longer be useful to you and you will wish you could throw it at the person’s face. Also I did most of the side quests mainly so that Claptrap would shut up. He is quite annoying. But I did some others because they allow you to fight bosses that are not in the main story, like a giant Skag. Its called a Skagzilla, how awesome is that. They may also take you to areas that you haven’t explored, the only good thing about them are the Claptraps, you will be able to repair which will give you more inventory space. The game itself has some very good points. I promise you that choosing what skills and weapons you will use will drive you mad. Guns come in many different colours and sizes to say the least. Not only will you have to chose between which gun is the strongest but you will have to consider other things as well. You will have to compare fire rate, clip size, accuracy, elemental properties, and other skills the guns may posses. This can make it very difficult to just choose a different gun that the one that you are currently using. It gets even harder when confronting different enemies because different elements are better against different foes. The best thing to do is to have different guns for different situations but then your inventory will suffer. When they said that there was going to be more than a million guns, they were not kidding. And you will want to find them all, even if you will not use them. Skill trees on the other hand demand a much more careful planning because you will have to decide which tree you will want to marry, in a way, and spend all your points in. If you are like me, I assume you will finish the game at level 33, more or less. Which gives you about the 27 points to spend on any skill that has been unlocked. This mean you will be able to max out about 5 skills. So when I say you will have to marry one of the skill trees I mean it. Most of the skills are useful, if not at the beginning they will be in the end. Some provide you with extremely useful powers that will make the way you fight very different from players of other trees. If you have skills that are activated when killing enemies, you will not have to chose which ones get activated. They all will, which will grant you some pretty awesome boosts. Shooting people was never as fun in any other game as in borderlands where guns are limitless (as in quantity) and killing a dozen bandits is just fun. Oh and no guilt trips for killing the wrong people which is great. Aside from all that, the place does look really cool. The style of the game makes it stand out and always reminds you not to take things too seriously but to just keep shooting and laughing at the way the bandits die. I said you wouldn’t laugh very often but once in a while when the amazing death animation play you will find yourself smiling. Bandits will burn up and disappear in the wind as ashes, get electrocuted, melt before your eyes, and then some. It will make it worth watching. The combat animations are not out of this world but they look natural and you will not look away at horrible things that move. As for the whole place, its one big desert and the style is consistent through out the game. It is easy to look at but not so cartoonish that you feel like you are playing a kids game. Trust me, you will not feel like that, ever. Aside from that, bosses will look unique with their own armour but the common goons will all look the same. Some bosses will get their own introduction which you will always remember, but there is only about five of them who are introduced. The rest just pop out of nowhere and you will only know that you are fighting a boss because your first shot didn’t kill him. Your second might, so don’t despair. I don’t have much to say aside from try it. I know I wouldn’t recommended it, but if you really want to play it to know the story go ahead. If you think you can get past the Skags and the first area, it does get better but not much better. I have heard the second one is a lot better, so I say, read the story from wiki or something. It is sad because it had so much potential, but they just played it safe and it ended up being repetitive. This entry was posted in Reviews and tagged bandits, borderlands, cartoon, desert, guns, skag, violence. Bookmark the permalink. « Build and fight your own mini robots!